Let me start by saying that I know and like James Laws, founder of Ninja Forms, and also consider Carl Hancock, one of the guys behind Gravity Forms, a friend. So anytime you write a post about the products of friends, you navigate careful waters. But people still have to choose what WordPress form plugin to use, and that’s what I do here – I help people make choices by doing comparisons. How do you choose a WordPress form plugin for you and your site? Focused on spreading the cost over multiple projects, or on a per-project basis? The first thing you need to figure out is what kind of person you are. Are you the kind of person that invests in learning one form plugin and plans to use it on all your projects? Or are you the kind of person that picks the perfect plugin tailored for the specific site/project? That’s a pretty important distinction that I think gets lost a lot because people start talking about how much money they might spend, but it’s important to determine if you’re dividing that cost and investment across one site, or across 30. Know what I mean? Focused on lowest cost or focused on potential capability? That also brings us to another question about yourself. Are you someone who wants to get the most out of their financial investment (and makes that their chief aim)? Or are you someone who doesn’t mind spending a bit more to make sure that in the long run, they’ll be able to tackle even the 1% edge case feature requests? Again, this gets to the heart of who you are, not the products at all. But it has a consequence. So your decision is actually more a reflection of who you are rather than what each of these WordPress form plugins do. When you combine these answers, you end up with this little set of options. If you are a “per project” kind of person, who wants to maximize investment and you care about cost – go with Formidable Pro. A single site license is $47. If you are looking to invest in a single solution across all your projects, but are still cost-focused – go with Gravity Forms. The total cost for everything is $199. If you are more focused on potential features than cost, and will push the cost over several projects – go with Ninja Forms. You could get away with spending $150. If you are more focused on potential features, but want to maximize benefit on a per site basis – go with Gravity Forms. You may even get away with $99. What you notice, from the options above, is that cost is a main differentiator. We’ll get back to that in a second. The reason that cost is a major dynamic is because overall, features has become less of a major differentiator. In other words, competition has driven most of the players in the field to deliver most of the features we all care about. Take a look at this grid. What you should notice is that for most of the questions, the answers are always yes (the green highlight). Now, sometimes there are nuances to the yes. And sometimes there’s associated cost with the yes. But the overall dynamic is that feature for feature, Gravity Forms, Ninja Forms and Formidable Pro offer end users most of the same features. It’s not exact. It’s not a perfect match. And my friends who run these companies are well-versed in the nuances. But for you and me, not living in this world all day long, for people who want to build a form and use it, competition has pushed them all to deliver mostly the same kinds of features. I know this makes the plugin owners potential cringe, because all of us (me included) likes to think at the level of the nuances. But as I met with thirty folks today and talked with them about forms, it was clear they weren’t steeped in the nuances. They had businesses to run. 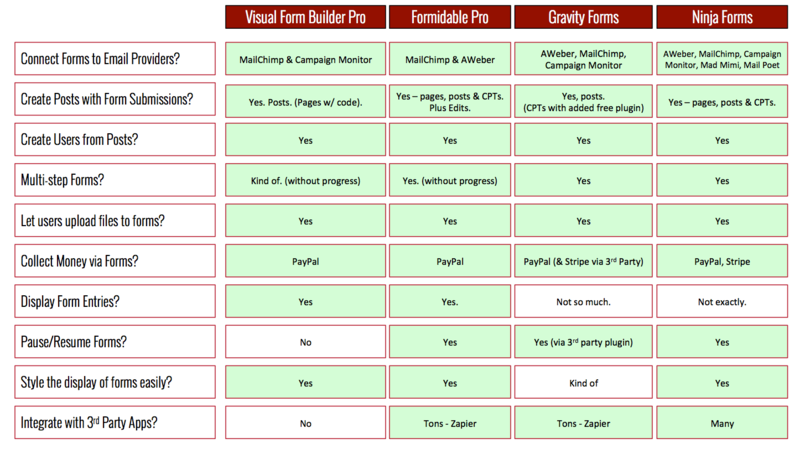 Take a look at this comparison of the form builder panels of each, and you’ll see I’ve made my point. Most everyone offers most everything. And that’s a good thing. So if everything is similar, how are they different? I think the big issue is that these are products have different business models, and they’re priced differently. Let’s start there, with pricing, since it’s easiest. The low price leader is Formidable Pro. But here’s the thing. You can choose to go low price, but eventually someone will try to go lower. Visual Form Builder Pro is that somebody – doing many things, and in some cases for less. 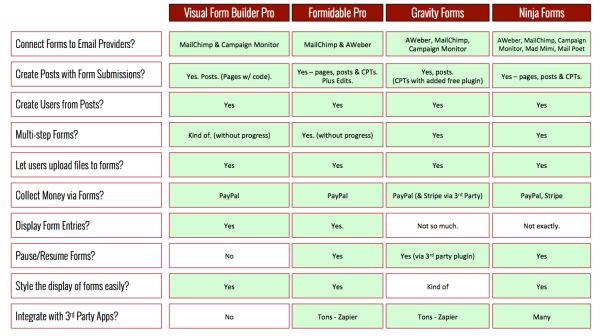 I don’t doubt that Formidable Pro and Visual Form Builder Pro may race each other to the bottom. Not sure I want to watch, but I think it may happen. Neither Gravity Forms nor Ninja Forms are trying to do everything for next to nothing (in price). And I say that even after knowing that Ninja Forms starts off its base product as free. I know that. That said, when you compare Gravity Forms and Ninja Forms, each will likely show how it’s cheaper. This is like watching AT&T and Verizon fight (one says they’re bigger based on customer count, the other says they’re bigger on customer revenue). Gravity Forms is cheaper if you load everything in and compare it to everything purchased with Ninja Forms. In that case Gravity Forms is cheaper and wins. But why would anyone buy all the extensions for Ninja Forms, especially all up front? Instead, you would pick one or two, and in that case, things would be different. Then Ninja Forms is cheaper and wins. But being the cheapest, while popular, isn’t the only thing that drives me. I care about more than just a $10 or $25 savings. What I like about Gravity Forms is that I learn one tool and then can quickly use it across all my projects. What I don’t like is that it takes me hours with CSS to make their forms look good. What I like about Ninja Forms is that they offer a ton of features. What I don’t like is that I have to install every feature via a plugin and they don’t help. So I burn a lot of time just getting things in place. Let’s talk about where they shine. Gravity Forms has the best conditional logic for form responses and auto-response emails. It also has over 100 extensions and add-ons, giving you tons of third party options. Ninja Forms has fantastic support for on-page (or front-end) posting and editing. It’s truly awesome. But it does more than that. It natively supports the pause/resume feature that may have been the most requested feature Gravity Forms heard over and over again. Now that I’ve tried to help you compare these products, let me share with you my last takes on these competitors. When it comes to WordPress form plugins, I think Ninja Forms and Gravity Forms will keep pushing each other to get better. But I also know that their destinations are potentially different. I think Ninja Forms wants to be the best WordPress forms plugin in the whole ecosystem. And they’re on track to keep moving forward and delighting customers all year. 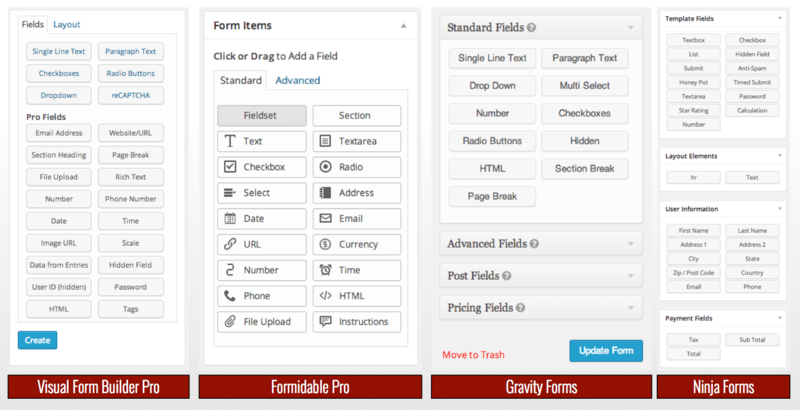 I think Gravity Forms wants to be the best, but not just in the WordPress ecosystem. I think they’re looking at Wufoo and Formstack and planning out their next steps. These different agendas will clearly impact their roadmaps and next steps. Thankfully, I think all of it will likely still be good for the rest of us.